Libyan temporary prime minister accuses UN envoy, with US and UK backing, of trying to integrate Brotherhood as civil war rages. Libya has sunken into a civil war since former dictator Muammar Gaddafi was ousted and killed in 2011, and in effect the state has split with no central rulership - in the chaos, America is being blamed by Libya's temporary government of trying to give Muslim Brotherhood power. 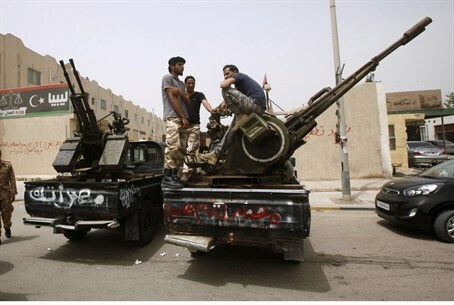 In Tripoli the "Fajr Libya" (Libyan Dawn) organization that identifies with the Muslim Brotherhood holds power, while Islamic State (ISIS) and radical Islamist militias are solidifying their control over various other cities. The temporary government which has been recognized with legitimacy by the international community has been displaced and forced to move to Tobruk in eastern Libya. It has been trying to push back the Islamist militias through the army led by General Khalifa Haftar, along with Egyptian military aid. Abdullah Al-Thani, the temporary prime minister, recently launched a broadside against the United States, the UK and UN envoy to Libya Bernardino Leon, blaming them for trying to make the crisis worse. Al-Thani claimed that Leon is trying to advance a political agreement in Libya with American and British support, according to which the Muslim Brotherhood would integrate into the national agreement government. According to him, integrating the Muslim Brotherhood will only cause public objection, an escalation of the conflict and allow additional terrorist organizations to make their way into Libyan society. Libya has found itself under the thumb of Islamist terror, with ISIS recently executing 21 Egyptian Christians on Libyan shores, and just two days ago conducting an attack with an exploding car in the eastern city of Al-Kaba that killed over 40 people. Likewise armed terrorists recently fired rockets at the Al-Abraq International Airport in the east of the country, with nearly all airports currently closed due to the civil war. Al-Thani's accusations of American backing for a Muslim Brotherhood integration in the government come after anger in Egypt over US President Barack Obama's support for the Muslim Brotherhood government that was ousted in 2013. Reports have indicated a close level of connection between Obama's administration and the radical Islamist Muslim Brotherhood, of which Hamas is a Gazan offshoot.